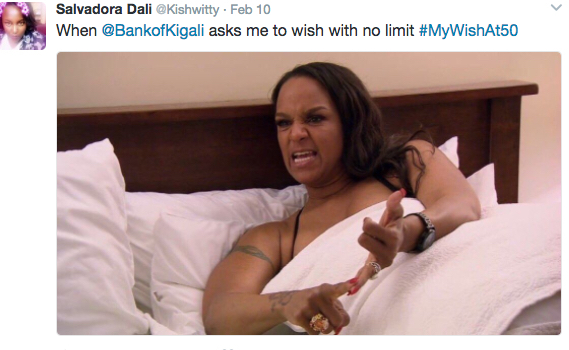 Could BK’s #MyWishAt50 Campaign Be The ‘Brand Gaffe’ Of The Year? Corporate firms are known for being exceptionally sensitive and always ponder every advertising campaign before releasing it so that it does not harm their brand. 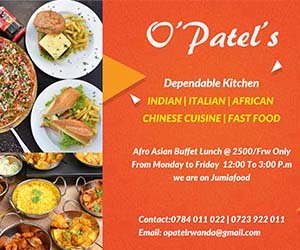 It turns out that, Bank of Kigali, which takes pride in its Rwandan roots and heritage, could have not pondered on their recent campaign which could be regarded as their greatest brand gaffe ever. Fortunately, may be not, the Bank has managed to go away with it. It all began with the Bank’s excitement of celebrating its 50th anniversary. A gigantic cake worth Frw600,000, we are told, was cut by the Bank’s Chairman Marc Holtzman and the Managing Director Dr. Diane Karusisi in the banking hall at the Headquarters. The whole exercise was flamboyant. The Managing Director reach out to the clients and hand everyone a piece of the delicious cake. In its branches across the country, a cake had been cut and shared with clients and invited partners. Clients had never experienced such a thing. For many, this was deservedly a brilliant stunt, not until weeks later when the Bank stumbled on its feet and made a terrible blunder. And the Tweets never disappointed. Social media junkies grabbed it from the word go. Tweets jammed the platform. Wishes of all kinds were made through out until the bank closed the “wishing campaign” fourteen days later. Now, there were wishes that aroused emotions such as this: “#MyWishAt50 is for my brother @jabz01 to get the right PROSTHESIS this year. Many more wishes for social projects such as one for a cancer awareness and treatment center, also those for houses and cars for poor hardworking parents, kept trickling in. As the days drew closer to the closing date, the campaign became flippant. Some wishes became buffoonery; an indication the public had began doubting if Bk was serious with the campaign. For example: “@BankofKigali what if I just want to own the helicopter?” And this one: “Bank of Kigali, my Chiquito I wish for a valentines date #MyWishAt50”. Others felt sorry for other banks in Kigali, and then BK began spotting the mockery in the flow of several wishes and the worry of a potential ‘brand damage’ the campaign could cause. We asked PR experts to help us dissect the Dos and Don’ts of this campaign. “This campaign is superficially nice, nothing more or less,” says one David who preferred his full name not to be disclosed for fear of losing his client for his views. Even when the economy is stable, which it isn’t, there can never be money for throwing around, at least for a listed company with shareholders to protect. Hence, from the word go the campaign seemed to have eliminated the citizens in the underprivileged bracket who fell short of the basic qualifications, drawing a thick line between the ‘Haves and Have Nots’ in society. This is an understatement of the fate of the poor, but the BK campaign in essence undermined social justice. Taarifa indeed saw the letter, but we are aware the guard is deployed at the bank. He is basically an indirect employee of the bank. A snapshot of the letter was tweeted by the official BK account. We understand that BK has been advertising with The Service Mag, and chances are that Sandra Idossou’s views might be biased. However, Agutamba said that the bank is planning another campaign on a wider platform, which he did not mention, but we presume it is radio or TV. Nevertheless, the bank is happy. “So, online engagements often result into offline engagement which is what happened in our case and we are happy,” Agutamba says. The 50 winners are yet to be announced, but the bank congratulated all participants. Why Are Some Hotels In Rwanda Closing?